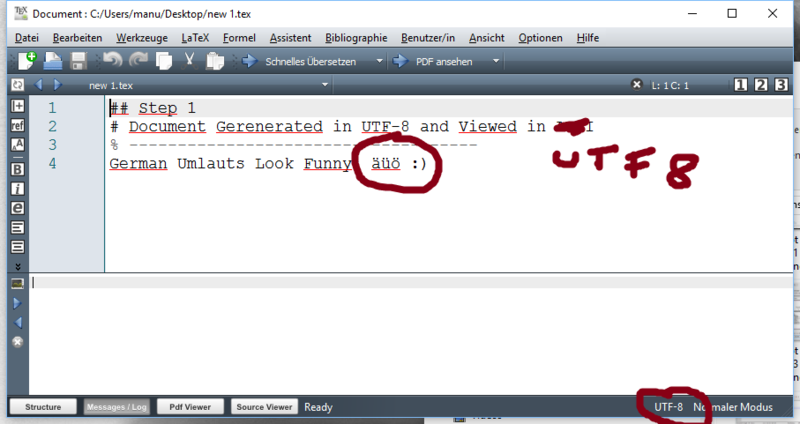 Even if I set the coding from TeXShop to UTF-8 Unicode and reopen the file, the umlauts are not shown correctly. Must I replace all the wrong umlauts on my own? Package inputenc Error: Keyboard character used is undefined in inputencoding 'utf8'. So how can I replace all the wrong values in the editor with the correct values and also make them work when I set the PDF file? I have already searched for it, but setting the coding from the editor to utf8 and using the packages like above was the only thing I have found. UTF-8 uses one to four bytes per character whereas ISO 8859-1 / ANSI always uses one byte. The first 128 characters (US-ASCII) need one byte -- this are the basic "easy" ones. This is why they are displayed correctly even when you use the "wrong" encoding for displaying them. This is the reason why the single umlauts are replaced by two characters when you display them in ISO 8859-1 or ANSI, see also https://en.wikipedia.org/wiki/UTF-8. 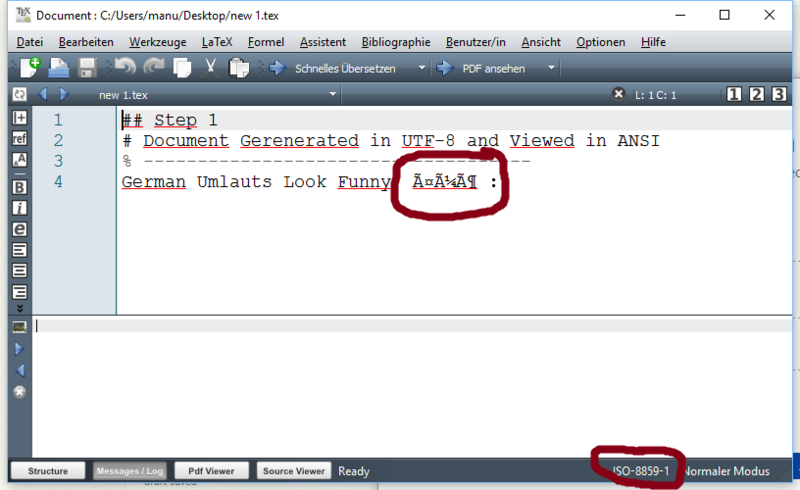 Setting your LaTeX editor to UTF-8 probably just means that newly generated files will be encoded using UTF-8 but it will not apply to already existing files. Not the answer you're looking for? Browse other questions tagged unicode input-encodings or ask your own question.